TV wasn’t the only screen Australians were glued to during Labor’s leadership challenge; mobiles, tablets and desktops kicked into overdrive. Today we look back on last week's Labor Party leadership change and chart the search interest of its four key players. On Wednesday, there was a huge spike in election-related searches throughout the day. From Kevin Rudd’s announcement that he would contest the leadership, through to the final result, searches relating to the election rose by 1065% (10x). Kevin Rudd was by far the most-searched politician throughout the day. Over the 12-hour period leading up to the ballot, searches for [kevin rudd] rose by nearly 100x; searches for [julia gillard] rose by almost 50x. 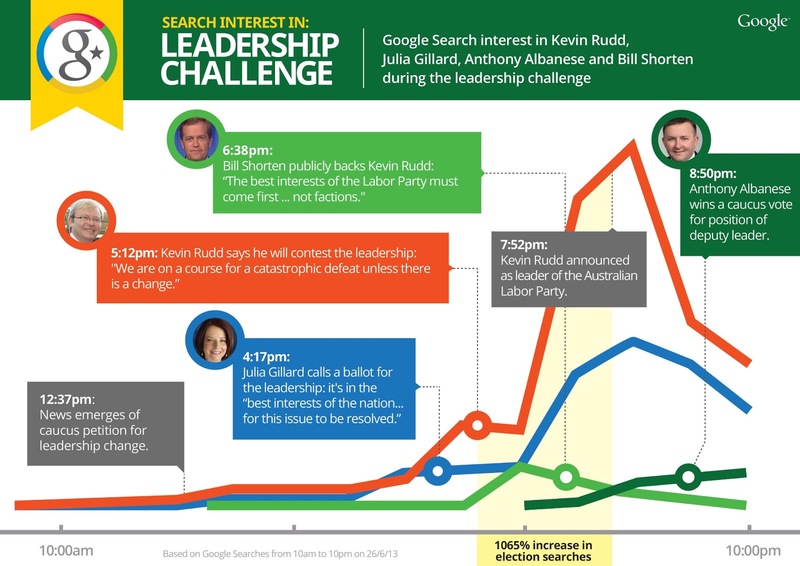 Meanwhile, [bill shorten]’s announcement of his support for Kevin Rudd saw searches for his name rise by 25x, almost matching the search volume for [julia gillard] at 6pm. There was another challenge on Wednesday night, but in a fight between politics and rugby league, politics came out on top: there were three times more searches about the leadership challenge than the State of Origin match. Want to find your own trends? You can use Google Trends (google.com.au/trends) to explore what Australians are seaching for on Google.